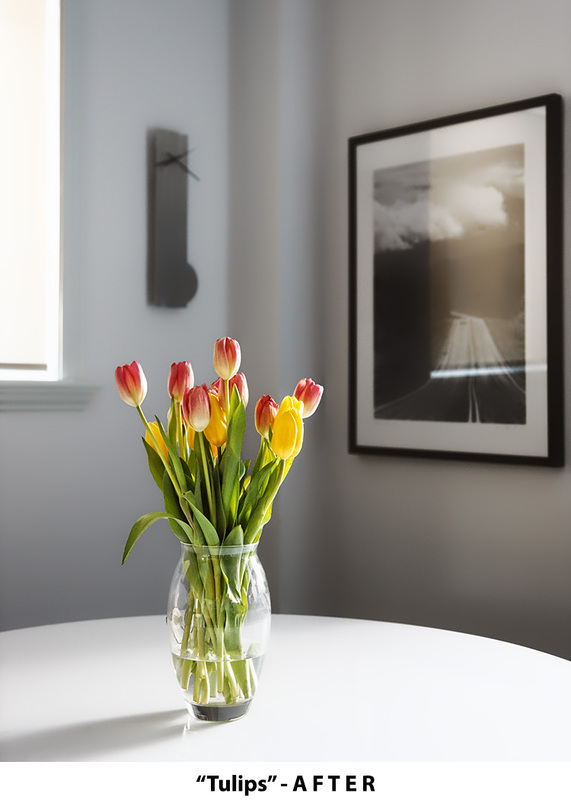 Tulips on a white kitchen table with soft natural light from a north-facing window - excellent potential for a still-life photograph. As I did with the image in yesterday's post, I broke this image into two pieces, worked on them separately, and then blended the two pieces back together. As you can easily guess, the two pieces were "the tulips" and "everything else". The key was to make the tulips shine (literally!) and to separate them from the rest of the frame. I used exposure and tone curve adjustments brighten the tulips and add contrast. I used fine-contrast adjustments to bring out detail in the leaves and flowers. 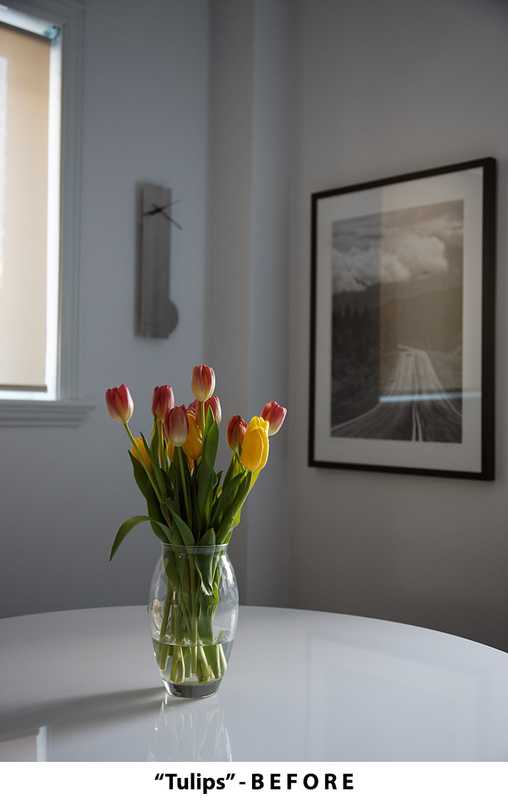 I added a bit of vibrancy to the tulips to accentuate the contrast between the colorfulness of the flowers and the grayscale tones of everything else in the frame. The background was already slightly blurred in the BEFORE image, and I softened the focus further with fine-contrast adjustments. I also used a tone curve adjustment to heighten contrast in the "everything else" part of the image. In doing that I deliberately blew out the detail of the tabletop - I wanted the tulips to be resting on a brilliant white surface. I corrected the the slight rightward tilt in the BEFORE image. I cropped the image to eliminate uninteresting empty space at the top and bottom of the frame.